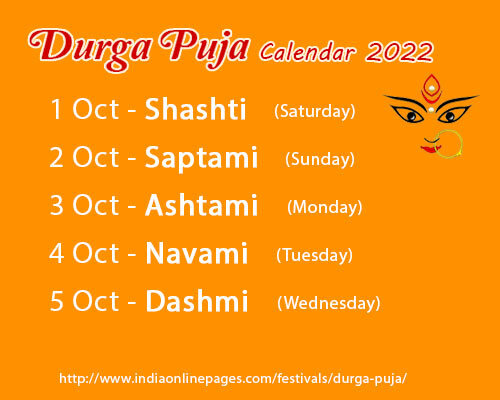 This section on Durga Puja Calendar features rituals, date and timings for Durga Puja in 2019. Durga Puja begins from Oct 3rd (Thursday) in 2019. On this day, a ritual called ‘Bilva Nimantran’ is performed ideally during sanyakal on Shashthi. But if Sanyakal prevails on Panchami Tithi, then Panchami Tithi is an auspicious time for doing ‘Bilva Namantran’. ‘Kalparambha’ is an early morning ritual which involves placing ‘ghata’ or Kalash filled with water and mango leaves in front of Goddess Durga. The devotee makes a resolution or sankalp to observe all puja rituals in a sacrosanct way during the next three days namely, Maha Saptami, Maha Ashtami and MahaNavami. Another ritual called ‘Bodhon’ is done to symbolically awaken Goddess Durga from her sleep. Since this is an untimely awakening, the ritual is also known as ‘Akal Bodhon’. In this ritual, the Kalash is installed at the base of the sacred Bilva or Bel tree. Prayers and mantras are recited to awaken Mother Durga. 'Adhivas' is a ritual for invoking the name of Goddess Durga and 'Adhivas' means symbolically installing Goddess Durga in the Bilva tree which is also sanctified by offering prayers. After ‘Adhivas’ is over, Goddess Durga is given ‘Amantran’ or an invitation to accept the Navpatrika Puja to be performed on the next day. Navpatrika Puja is performed on Maha Saptami and it is the first day of Durga Puja. Nine plants including the branch of Bilva tree is made and worshipped as Nav patrika. It is purified by bathing in water and putting a red colored cloth around it. It is placed alongside the image of Durga. ‘Mahasnan’ is an important part of Maha Saptami Puja. In this, a mirror is propped to show the reflection of the Goddess Durga and offered a ritualistic bath symbolically. After the bath ceremony, ‘Prana Pratishthan’ of the image or idol of Goddess Durga is done, which means the Goddess is consecrated and established in that place. This is followed by an elaborate Shodashopachara puja. In West Bengal, Navpatrika Puja is very popular as Kolabou Puja. 'Mahashtami' which is also observed by the name 'Maha Durga Ashtami' is one of the most revered and sanctimonious days of Durga Puja. On this day, nine small pots are ritualistically placed in front of the idol and Ma Durga's nine aspects are invoked in them to perform the Ashtami puja. Also, this day is considered auspicious for doing ‘KumariPuja’ which involves inviting and worshipping nine girls aged between two and ten years. The nine girls are worshipped as nine forms of Maa Durga. In Belur Math, ‘Kumari Puja’ is performed on Ashtami. Sandhi Puja is performed during the last twenty-four minutes of Ashtami Tithi and the first twenty-four minutes of Navami Tithi as it coincides with the moment when Devi Chamunda killed Chanda and Munda. 108 earthen lamps are lit to commemorate this special time. It is important to note that if Ashtami and Navami puja merge before Sanyakal on Ashtami day, then Ashtami Puja and Navami Puja including ‘Sandhi Puja’ are done on the same day. On MahaNavami, Goddess Durga is propitiated as ‘Mahisasuramardini’, a name given to the Goddess as one who annihilated Mahishasura. Navami Homa or Chandi Homa is carried out after the puja during the day time. It is an important rite as devotees seek blessings to remove all obstacles in life. Verses from Durga Saptashati are recited while performing the Homa. In West Bengal, the day of Mahanavami may not coincide with other states. In that case, it is observed a day after Mahanavami in other states. Also, if on the previous day Navami Tithi prevails for three ‘muhurta’ before sunset then Ashtami and Navami Puja including fasting are done on the same day. 'DurgaBalidan' which refers to ‘bali’ or sacrifice is done on Navami Tithi. In most places, a symbolic Bali with vegetables like banana, cucumber or pumpkin is performed. Vijayadashami is celebrated countrywide and is marked as the victory of Lord Rama over Demon Ravana and also the triumph of Goddess Durga over the buffalo - headed demon Mahishasura. 'Aparajita Puja', 'Seema Avalanghan' and 'Shami Puja' are ritualistically carried out on Vijayadashmi. SindoorUtsav is celebrated in Bengal on the day of Vijayadashami which is the culmination of Durga Puja festivities. It is a colourful ritual where in married women applies vermillion to one another. Men also exchange greetings and it is referred to as ‘Kolakuli’.